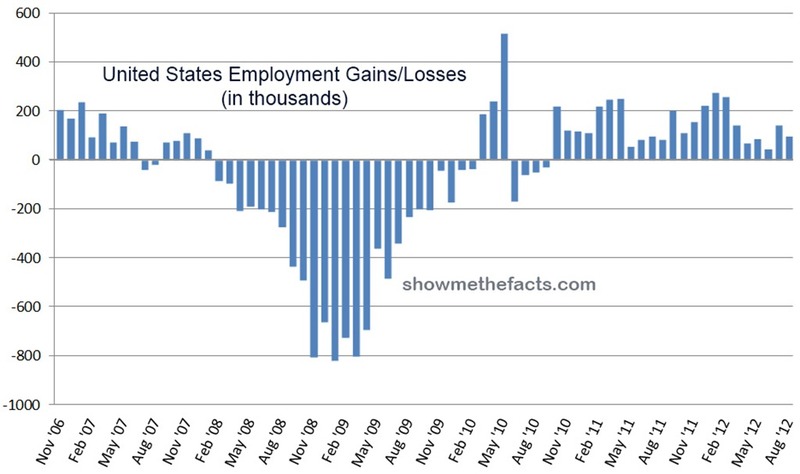 This chart shows the United States Employment gains/losses in thousands of employees from November 2006 to August 2012. Wait is this graph cumulative? In other words we lost about 6.8 million job in 08/09 and gained about 2.5 million in 10-12? Or… We lost 2/3rds of our job market during the Obama/DoJ Tyranny? Hi.. are you aware that Obama took office in Jan. 20th, 2009? As you can see from the graph you can’t lay the blame on the Obama admin which the losses that were happening were already in progress. As soon as Obama took office in Jan 20th. 2009, the job losses slowed tremendously. A year later, these losses turned into gains. Pretty remarkable I’d say. I am aware that he took office in Jan 09. But, he is also a puppet who has been given free reign to divide and conquer this country by the Corporate Government(the Bankers). In 09 his first act was signing the bail out order. In which the bankers stole 900 billion U.S. tax dollars. to “prop up” the failing job market. The U.S. is steadily losing jobs while at the same time the Obama Regime is giving jobs to illegal immigrants. With the “Gang of 8″ Immigration bill making it illegal to higher U.S. citizens with a $5,000 fine it will get far worse. The banker have been caught red handed and in order to avoid the death penalty they are manufacturing a civil war with in the U.S. Obama is working hard for his rich white masters in order to achieve their goals. If you think I’m wrong. We defeated Germany through the use of counterfeit bills. The United Soviet Socialist Republic was defeated with an economic collapse. The Federal Reserve bank is printing $85 Million a month. Soon enough they will crash our economy and flood the streets with their counterfeit fiat currency. Thus repeating WW1 Germany’s and Cold War era U.S.S.R horrific defeat. How does it feel to be insane? Does it hurt? Who is insane? The U.S. and European economy is in a downward spiral. The people of Cyprus had their live savings liquidated by the bankers. If anyone is insane it is the people who deny the truth and then wonder why/how it happened to them. The U.S. Constitution is under heavy attack… 1st 3rd 4th and 5th Amendments have been hit hard nationwide. The 2nd(and the proud citizens who enjoy it) is the only thing keeping us safe from a Nazi style takeover. Well I see you guys commented on this 3 years ago. But now its Jan 2016 and we have had the longest streak of job creation in American history as I hope you guys probably know by now. So Edwin cut the BS and I hope you are back in reality with us. The truth is every single republican president since Reagen has screwed our economy because of their disastrous policies and they brainwash all you american simpletons into thinking this right wing conservative extremism is the only way to do things. Obama could have done so much much more if he wasn’t constantly being opposed by a republican congress that just wants to put us more in a hole and he didn’t give incorporate interest. The next president must be a democrat and we need a democratic congress to get out of this mess reaganomics left us. So you assholes on the extreme right better start moving a little closer to the center of the spectrum where you were 40 years ago.